Among otherwise level-headed people musical theatre remains a peculiarly divisive form of popular culture. There are many of who would happily sit through two and a half hours of magic-soaked love stories in the forests outside of Thebes, or will extol the merits of a Turner-prize winner whose contribution to the artistic world is to create soundscapes under Glaswegian bridges. However present them with a Pulitzer Prize winner who has written musicals as diverse as an examination of the life of pointillist painter, George Seurat; or the gore-spattered grand guignol of the demon barber of Fleet Street; or even an unpicking of the psychological darkness at the heart of the Grimm Brothers’ fairytales, and they will raise their eyebrows and silently mouth the words ‘jazz hands’. Watching productions like Merrily We Roll Along act as a constant reminder why such narrow-minded viewpoints need to be challenged. Certainly the landscape of musical theatre has changed markedly since Stephen Sondheim made his career by writing the lyrics for Bernstein’s West Side Story. The rise of Andrew Lloyd-Webber that introduced pop-sensibilities and extravagant staging to Broadway couldn’t be further away from the nuanced lyrics and subtle melodies that encapsulate the magic of Sondheim. The divide only got greater in the last two decades, as the rise of the mega-musical from Mamma Mia! to We Will Rock You saw a new way for theatre producers to cash-in; tapping into the recognition factor of proper bands set against a licence to perform them in a sub-par way with a witless plot under the banner of ‘musical theatre’ – surely as lowest common denominator entertainment goes these productions are right up there with ‘X-Factor’ and ‘Britain’s Got Talent’. The Menier Chocolate Factory must be applauded for setting itself against the tide and producing a string of Sondheim revivals that remind us that there are people out there who see no distinction in artistic merit between a ‘play’ and a ‘musical’. 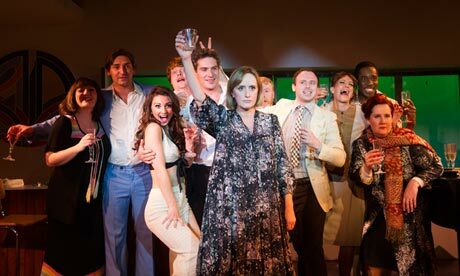 In bringing us A Little Night Music, Sunday in the Park with George and now Merrily We Roll Along – transferred to the West End – the Menier has proved time and again that there is a space for intelligent, difficult musicals that can be both commercial and critical hits. 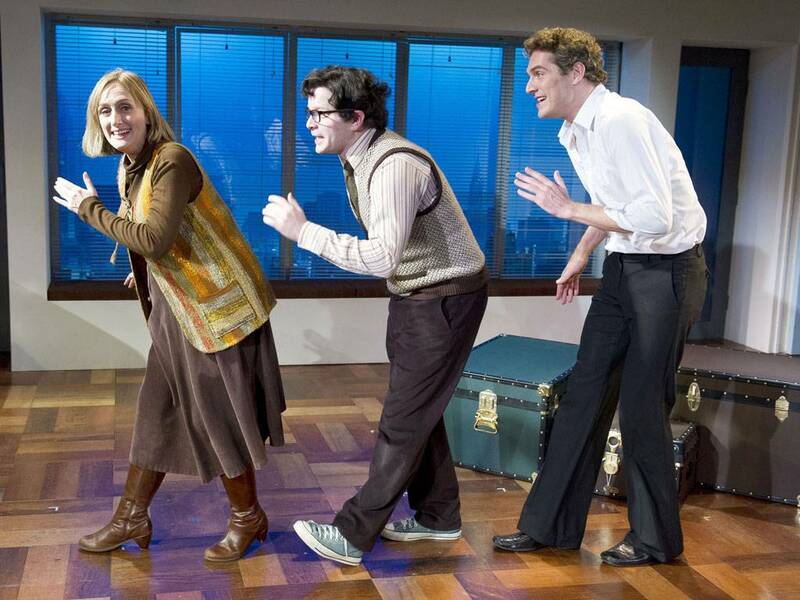 Merrily We Roll Along, a notorious flop when it opened, has taken two decades to gain similar levels of acclaim to what are seen as Sondheim’s masterpieces. However the intervening years have only served to increase its relevance to the audience. Charlie’s bitterness at Franklyn’s desire to follow the money and to leave ‘proper’ writing behind him only seems more familiar to a theatre-scene where, despite writing the lyrics for the commercial smash-hit of Matilda, Tim Minchin finds it difficult to raise any funding for a musical that isn’t based on an existing concept. Having seen the first major UK-production at the Donmar Warehouse in 2000, with the magnificent Daniel Evans as Charley, Samantha Spiro as Mary and Julian Ovenden as Franklyn, Merrily We Roll Along has subsequently been imprinted onto my consciousness as one of the truly great musicals – right up there with Anything Goes and Cabaret – and as fine as anything Sondheim as produced. The Donmar version was blessed with a great cast and a lightness to the production that turned the potential difficulties of the Donmar space on its head. Even in his transition scenes Sondheim writes repeating motifs that lesser composers can only dream of – Merrily We Roll Along – and at the Donmar this worked in harmony with the space to contribute to a sense of movement that reflected the sense of time passing, a world in a constant state of motion. Maria Friedman’s directorial debut is stylish and sleek but ultimately is a safe and slightly conservative production. The limitations of a small stage with limited entrances/exits and the need to continually place the audience in new time frames is handled well – often through costume and slyly referential props – but it is hard to ever entirely shake the original late 1970’s setting of the opening scene . The cast is excellent throughout – from the leads through to the chorus, who pop up throughout to be key elements of Frank, Charlie and Mary’s lives – and in Jenna Russell (Mary) they are lucky to have one of the great Sondheim interpreters of our time. Ms Russell’s role in Sunday in the Park with George won her an Olivier Award and Tony Nomination, and her Baker’s Wife in the Regent’s Park Open Air Theatre was one of the highlights of a fabulous revival. Mary is a difficult role, as it needs to balance the snarky cynicism that draws in some of the best one-liners alongside the visible emotional wounding of being in love with someone who will only ever see them as a friend. It is the skill of Sondheim that, as the years wind back, we see that it is Mary that is the beating heart of the trio and that she constantly sacrifices her own feelings in order to keep Charlie and Frank together. The last scene, or the first of the straight chronology, is heartbreaking and full of optimism in equal measure; the audience knows the way it must end, but as the trio stare up at the stars and watch the possibilities signified by Sputnik, the audience shares their optimism for the future. Ultimately the success of most musicals is based on the amount of ‘hit’ songs. The kind of numbers that finish with a bang and a pause so the audience know they need to applaud. Sondheim is constantly accused of not writing melodies – a fact he skewers himself on in the number ‘Our Time’, when a producer asks ‘we can’t you throw ‘em a crumb? / What’s wrong with letting them tap their toes a bit? 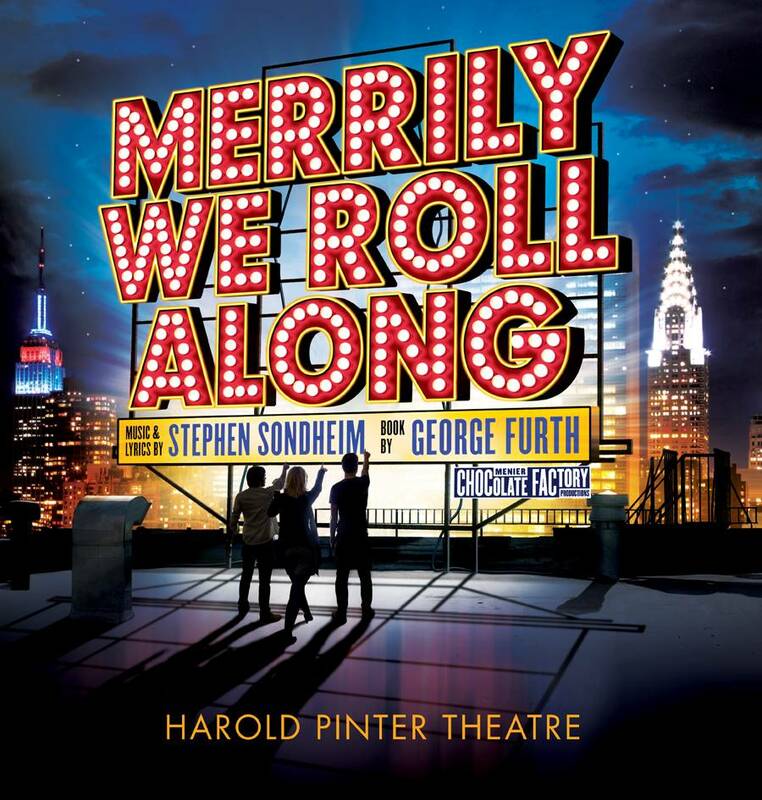 / I’ll let you know when Stravinsky has a hit / Give me a melody’ – but Merrily We Roll Along is packed full of songs that lodge themselves in the memory. Damian Humbley’s Charlie brings alive Franklyn Shepherd Inc, a wonderful but cringe-inducing presentation of how Charlie and Frank work together and a song that opens up the passive-aggressive nature of his relationship with Frank. The slightly wheedling aspect of his friendship provides a chink of light that allows the audience to find some sympathy with the otherwise rather despicable, self-obsessed Frank. And if Sondheim is to be accused of not being able to write a melody then someone will need to explain away Good Thing Going, one of the most exquisite songs in the Sondheim playbook and that sits alongside Minchin’s When I Grow Up in Matilda, or True Love in High Society. If this production does not quite meet the standards of the Donmar’s version it does not also mean it isn’t worth going to see. After a 12-year wait for a return to London, and for its first major West-End run, Merrily We Roll Along is an unmissable part of Stephen Sondheim’s catalogue, and also the closest to a biography he has produced. It is blessed with a superb cast, no identifiable flaws and a wit and intelligence to its songwriting that you could spend a long-time searching for in the rest of the West End.